P&P level for this product is: FREE! Medikoi Probiotic is a multi-season food, scientifically formulated to significantly improve digestion and nutrient uptake resulting in very low waste and an all round improvement in colour, growth and health. 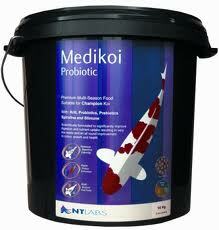 The highest quality ingredients in Medikoi Probiotic make the food extremely palatable and digestible. Not only does the food provide the beneficial probiotic bacteria for Koi but it contains a food for the beneficial bacteria too in the form of a prebiotic (fructo-oligosaccharide). This combination ensures a vigorous population of gut bacteria and digestive enzymes which over time results in a vastly improved ability to absorb nutrients, optimizes body mass gain and massively reduce waste.